See Run retail version without the CD on how to bypass the disc check. Can be played without Steam. Pre-packaged with DOSBox 0.73. Update to 0.74 for better performance and some color issue fixes. The DOS version has no patches (the Install.exe listed on the support page is not for this game). 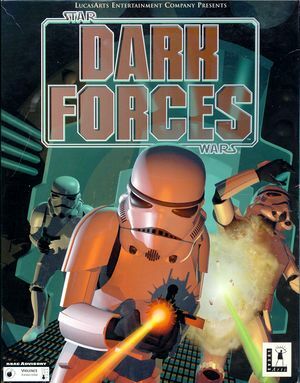 The 1.2 Update patch fixes some issues with the Classic version of Dark Forces. Dark Frontend is a utility that allows easier launching of mods and levels. Installation (of both the launcher and the mods you intend to use with it) isn't exactly the most straight forward; includes a digital manual (readme.exe), reading it is recommended before using. Config file is not human readable. A partial explanation on how to edit it can be found here. DOS version runs at 320x200 (see the DOSBox page for more information) and Mac OS (Classic) version runs at 640x480. Press Alt+↵ Enter in DOSBox (CMD+F in Boxer). Use INSTALL.EXE (KEYCONFI.EXE in the demo) or SETUP.EXE. Mouse settings cannot be changed in the demo. Some keys cannot be mapped. See fix below. Some menus only work with mouse. Game lacks vertical-look for mouse. See hack below for adding it. Use INSTALL.EXE (KEYCONFI.EXE in the demo) or SETUP.EXE. Designed for keyboard and flightstick. 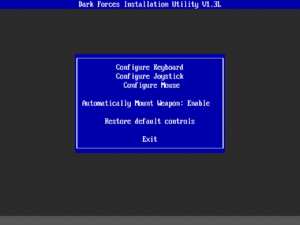 Use Dark Forces Plus, compilation of DOSBox keymapper files and GlovePIE script. Could use FreePIE as alternative to GlovePIE. GlovePIE and FreePIE are Windows programs; they do not work on Mac or Linux. Sound channel settings in setup.exe. Uses stereo output with some 3D spatial effects. For DarkXL, use OpenAL Soft. This game supports the MT-32 and General MIDI for music. Go to the Dark Forces installation folder. Go to the [render] section of the DOSBox configuration file and change aspect=false to aspect=true. If you are using Boxer, you can also use the View - Use 4:3 Aspect Ratio item in the menu. Perform a full install within DOSBox. Copy the CD.ID file from your Dark Forces CD, to the folder you have mounted as DOSBox's C: drive. Use a text editor to open the DRIVE.CD file in your Dark Forces installation folder. It should contain one letter. Change it to C and save it. Disables the ability to change configuration in the setup.exe (says you must install the game first). Copy the CD.ID file from your Dark Forces CD, to a new folder (which you will later mount as drive D). Copy the BOOTMKR.EXE and IMUSE.EXE from the CD or the installation folder to this new folder (the IMUSE.EXE must be in a \Dark sub folder to be detected by the configuration utility). Mount the folder as drive D, then play! Slightly more involved than the above fix for simply the ability to use the configuration utility. Significantly leaner than having an ISO mounted to access setup.exe (GOG.com and Steam versions). Files can be mistakenly deleted using the "Remove modules" option, marking files as read-only is recommended. Install the game through Steam. Download the latest DOSBox version. Run the installer and point it to the Dark Forces installation folder. 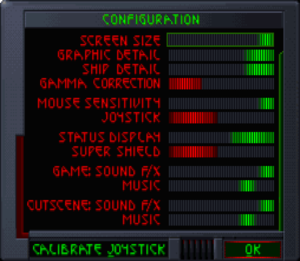 To run Dark Forces without Steam, run dosbox.exe directly. To run with Steam, launch as usual. Enables playing the game in modern Windows. Supports high resolutions, with enhanced visuals and proper mouselook. Sadly however, the project no-longer appears to be in active development, and the most-recent alpha version has some unresolved issues such as missing cutscenes, no music during cutscenes, a float/noclip function bound to the F key that cannot be rebound, and other issues that require workarounds to correct. However, the game can still be completed in this form albeit with a patch that doesn't work on Windows 10 (see Getting started with XL Engine). ↑ Any references to "the demo" on this page refer to the first demo. ↑ 4.0 4.1 File/folder structure within this directory reflects the path(s) listed for Windows and/or Steam game data (use Wine regedit to access Windows registry paths). Games with Steam Cloud support may store data in ~/.steam/steam/userdata/<user-id>/32400/ in addition to or instead of this directory. The app ID (32400) may differ in some cases. Treat backslashes as forward slashes. See the glossary page for details. 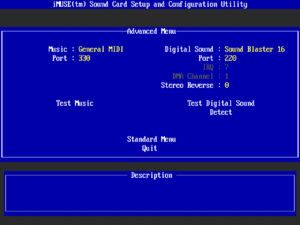 ↑ Verified by User:SirYodaJedi on July 21, 2018 using General Midi (VirtualMIDISynth) for Music and Sound Blaster 16 (DOSBox emulation) for Digital Sound Effects. This page was last edited on 8 April 2019, at 07:02.